While graphical package managers like Synaptic or KPackageKit certainly are great tools for the novice Ubuntu user, I personally don’t see any benefit against the various apt CLI bindings. For one, I’m not a big fan of using GUIs where not needed and secondly, the graphical package managers’ search features come with extra baggage – they use Xapian in a cron job for indexing, which can be quite a CPU hog. Even though Ubuntu has good defaults and uses ionice to schedule for IO priority, this setup caused my system to hang completely. To be fair, I should mention that I run VirtualBox instances in parallel. You can also uninstall KPackageKit or Synaptic completely, but you would lose your update manager reminding you of new packages. To me, fullscreen does magic in terms of gained productivity – there’s no distraction anywhere; I can perfectly focus on the work ahead. MacVim has a nice fullscreen feature(CMD+SHIFT+F). I don’t want to miss it in my Linux environments, though. 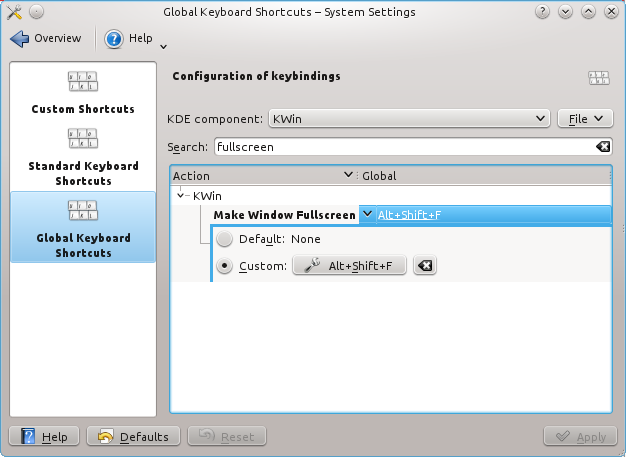 In GVIM, there is a little manual labour involved, because in Linux, the window manager is responsible for, well.. managing windows – GVIM itself can’t implement “fullscreen”. 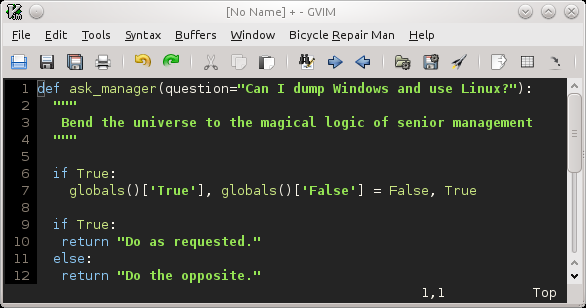 Of course, you could edit your vimrc and set those flags globally. Now, enjoy your editing with SHIFT+ALT+F. Searching for a viable option for endusers to reset or change their passwords, I have come up empty. Maybe I just searched wrong. Webmin supports user administration. Any account can implement the role of “Change Passwords”. Unfortunately, this will enable this particular user to change any other users password. Lucky for me, Webmin is OSS and written in Perl. So a quick four line code change does exactly what I need. This is how the Munin front-end looks after the patch. If you’re not root, you can only change your own password. End of line.